As babies grow, what they eat, and how much they eat will slowly change, which makes it important for parents to keep up with them. Here’s a handy note that tracks how a baby’s nutritional needs gradually changes over time. Breast milk is the ideal food for a baby’s growth and development, while also protecting the baby from various diseases. For the first 6 months of life, it’s highly recommended that babies are only given breast milk. Breast milk should be given within the first hour after birth. In fact, babies don’t need any other liquids, not even water, if they are getting enough of breast milk. By 6 months, a baby can start having complementary foods besides breast milk. They can first be given soft or mashed cooked vegetables or fruits like apple, carrot, potato or others, as long as it’s not too hot. 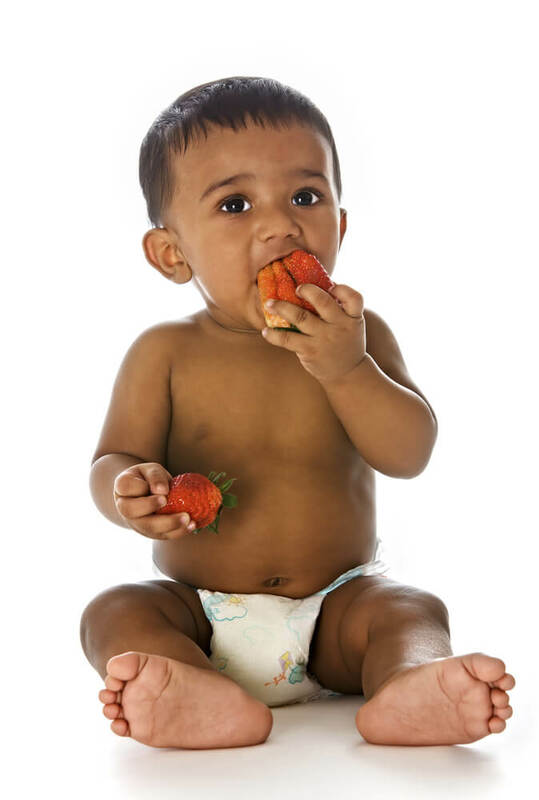 Babies can be given little pieces of food, roughly the size of an adult’s finger that they can hold in their hands – e.g., ripe, soft, banana. Gradually, they can start eating rice, chapatti, dal, dairy foods, tender chicken (if non-vegetarian) etc. There shouldn’t be too much sugar to the food. Babies can start sipping water from a cup. From about 8-9 months, babies can slowly start progressing towards 3 balanced meals which are a mixture of soft, chopped and mashed foods that contain a variety including rice, bread, potatoes, beans, dairy, and some non-vegetarian foods as well (in families that eat non-veg food). After babies turn 1-year old, they can now digest cow’s milk. By now, they also regularly eat 3 meals a day. Full-fat dairy products can be given to children since they receive a lot of valuable nutrients and fat from these. Babies can continue to receive breast milk even after their second birthday. In India, babies are breastfed for a median time of 2 years. Click this link for more info on specific nutritional needs for your growing child. Of course, as you start introducing new foods, children can be fussy and it can be very frustrating at times to have them refuse whatever you put on their plate. Is your child a little picky and fussy about food? Check this link for some useful tips to make meal times less of a battle zone. World Health Organization. Nutrition: Exclusive breastfeeding. http://www.who.int/nutrition/topics/exclusive_breastfeeding/en/. World Health Organization. Healthy Eating during Pregnancy and Breastfeeding. 2001. http://www.euro.who.int/__data/assets/pdf_file/0020/120296/E73182.pdf. World Breastfeeding Trends Initiative/Breastfeeding Promotion Network of India. ARRESTED DEVELOPMENT. 4th Assessment of India's Policies and Programmes on Infant and Young Child Feeding http://www.bpni.org/report/WBTi-India-Report-2015.pdf. NHS Choices. Your baby's first solid foods. http://www.nhs.uk/Conditions/pregnancy-and-baby/Pages/solid-foods-weaning.aspx.